A piece of stiff fabric, roughly the shape of a long, narrow triangle and sometimes boned, that covered the gap of the robe over the stomach and chest. 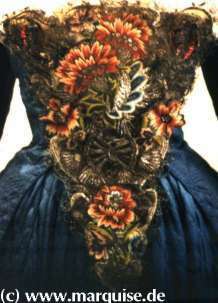 It was covered with fine fabric and often heavily embroidered and/or decorated with lace. The fronts of the robe were pinned onto it to hold them in place. If the corset itself was beautifully done, the stomacher could be dispensed with, but then corset and robe would have to harmonise in colour, which would result in having to have as any corsets as robes. NB: the display on top of the robe is only so's the stomacher can be seen in full. It is also made for a considerably larger dress.